NOTHING MORE THAN AN ENTERTAINER. Interlocutor: Overcoming the distances, David Copperfield in his theatrical shows flies on the stage, Did he achieve levitation somehow or it is merely an ordinary trick? Ron Hubbard: It is a vulgar trick of illusionism. He achieves the flight by using thin cables that sustain him and these cables are camouflaged with similar colors to those found on the stage so that they are invisible to the human eye and they are even located strategically in his body so that a hoop can go through and simulate that nothing there is sustaining him. The trick of passing a hoop through a body sustained with cables is an old art of illusionism that doesn't have anything of surprising. Interlocutor: The mission of David Copperfield was to only embody to amuse to the public? Ron Hubbard: No, his specific mission was to investigate the paranormal phenomena, as Harry Houdini did it before, although he was devoted to persecute to all the mediums, because he didn't believe in mediumship. Interlocutor: I remember that Houdini tried by all possible means to communicate with his mother... Did he achieve it? Ron Hubbard: Finally He did, but he didn't believe it, because he thought he was hallucinating. Interlocutor: I can hardly believe it... So much effort for nothing! 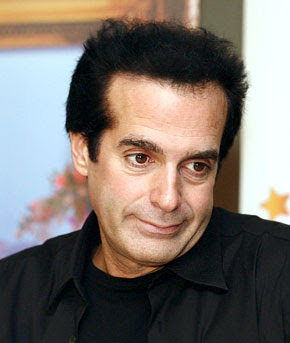 Regarding to David Copperfield, Is he generating karma by astraying from his mission? Ron Hubbard: When somebody decides to embody in order to fulfill a certain mission in favor of mankind, and instead of fulfilling it he is devoted to entertain people in tent shows that the only thing they do is to feed his Ego, of course that karma is generated and it will even make him lower of plane. I want to clarify, to avoid misunderstandings that entertaining the public is not bad, what it’s bad is to astray totally from a conventional mission. I am not speaking about a particular pact with somebody, like it’s done in the physical plane; I am talking about an implicit pact. In fact, David Copperfield made a pact with himself, to embody with a certain mission, and while he is not fulfilling it, he is transgressing that pact, which is very serious. Although he didn't make a pact with anybody, I repeat that pact was implicit. It is something similar when you are engaged to somebody, where faithfulness is implied although you have not made any pact, and then you transgress it by being unfaithful. The same thing happens if you work as a cashier in a bank, although you have not made any pact with anybody, it is obvious that it is implicit that you won't keep other people's money. If you steal, you will be transgressing that implied pact. Interlocutor: It is clear... Now then, why the karma that David Copperfield is generating will make him lower of level? Ron Hubbard: Simply because in the higher planes one cannot have karma. Interlocutor: Is David Copperfield, then, an evolved spirit? Ron Hubbard: Yes, he is a higher spirit, but his incarnated part in the physical plane is very basic. This entry was posted at Saturday, July 04, 2009 and is filed under Who are they? . You can follow any responses to this entry through the .